I hope everyone had a good weekend! Can I say I’m glad it’s over? Ugh, this weekend was nothing but bad luck it seemed for me. Today just didn’t start off on a good note. I went to Aldi to go grocery shopping and lo and behold, my check card is missing. Hmmmm, I wonder where that went to. Needless to say, my husband had to drive 20 miles, through a detour to bring my card since he doesn’t know how to put things back in their rightful place. Next, as I mentioned in an earlier post we were cutting down trees this week. Well, everyone was so good with no injuries but today unfortunately wasn’t the day for that. So now my CPR/First Aid certification which I was required to get from my previous job finally served it’s purpose, for the most part. You know how them males are and their stubbornness! At least a girl tried. Last but probably not least, I started my dish towel on fire. Yup, only I could do something like that. And we don’t even cook with gas! Apparently the heating elements in the oven get so hot that something could accidentally touch it for one second and it will go up in flames. Doesn’t help that these are very old dish towels from my grandmas era and I think they are coated with something. Lesson learned there, use an actual oven mit whilst touching the grates! Any who, at least I got something delicious out of this whole mess of a day! While I sit here and look over at my husband stuff his face, I know that this one is a keeper! This pizza is awesome. Quick and easy just the way I like it. 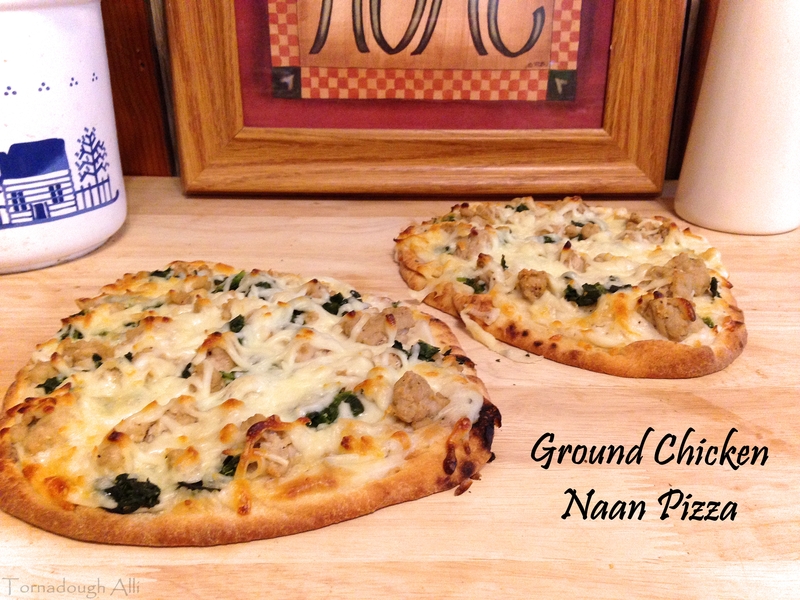 Plus I love finding Naan on the discount rack, I always stock up since it’s amazing for pizza! Hope you enjoy this just as much as we did! Pre-heat oven to 400 degrees. In a skillet, brown ground chicken, remove from heat and set aside. To make the sauce, in a sauce pan melt your butter. Once melted add the flour and stir until combined. Slowly whisk in your milk. Add the garlic, basil, salt, pepper and cheese and stir until cheese is melted. Pour desired amount over each piece of naan and spread around with spoon. Reserve the remainder for dipping. Next, add the chicken to the top of the naan, sprinkle with the spinach and top with cheese. Bake for about 10 minutes or until cheese is melted and bubbly. Serve with reserved sauce and enjoy! Thanks for visit! These were really good. Definitely making them again soon! Ummmmmm…YES! I need to make this! If anything, I think that garlic white sauce recipe is a good thing to keep handy. 😉 Looks fantastic. Thanks dear! The white sauce is goon enough to be served alone with bread for dipping! wow brilliant idea! thanks for sharing it looks delicious! Thanks! This will be made again! So quick and easy. Thank you so much for stopping by! This was a good end to a bad day. Plus it didn’t take me hours to make! Wow these look good! I wish naan ended up on the discount rack at my grocery store! I catch it I sale a few times for $1.50 for a pack of 2 so I can’t pass it up! Your chicken pizza is the perfect end to one of those Very Frustrating Days. Thanks for sharing your wonderful recipe and story at Foodie Friday!